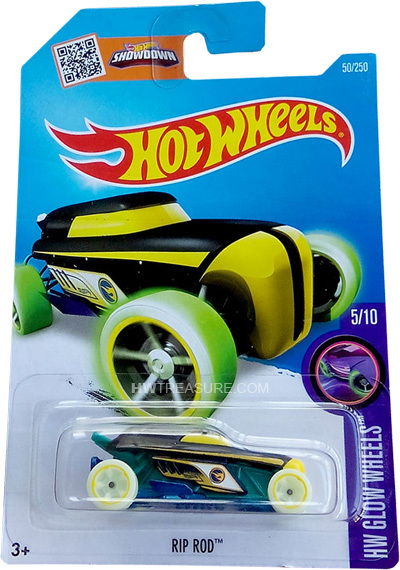 50/250 is a 2016 Treasure Hunt and 5/10 in the HW Glow Wheels series. It features a black body, yellow grille, yellow windshield, and yellow side stripes. The body sides each have a white, yellow, and black graphic with the low production symbol. The car has a teal interior and sides, a blue Malaysia base, and glow-in-the-dark Muscle Car 5-Spoke wheels with yellow rim stripes. 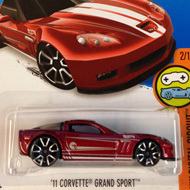 This vehicle can be found in mix “C” of 2016 Hot Wheels mainline cases. The vehicle made its debut in the HW Off-Road: Test Facility series in 2014. 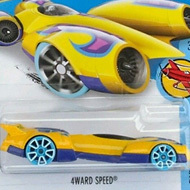 It is a unique design with the appearance of an off-road capable classic hot rod.